Siddal paid the price for a series of unforced errors as they suffered a disappointing 32-22 defeat away to mid-table Underbank Rangers in the Premier Division of the National Conference League on Saturday. The Halifax side had over-powered their opponents 44-18 in the home fixture on May 12 but in spite of some promising periods of play they were unable to complete a double. They again conceded an early try. After five minutes stand off Owen Restall broke through the visitors’ defensive line to pass wide to centre Alex Chatterton, who touched down. Scrum half Richard Pogson added the extras. Siddal didn’t waste any time in drawing level as Gareth Blackburn’s restart was taken by skipper Byron Smith on the charge. From the next tackle Gareth English fed Tom Garratt who crashed over. 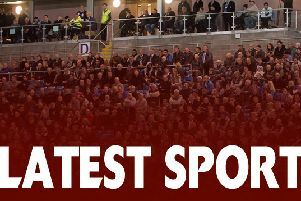 Blackburn’s conversion made it 6-6 after seven minutes and Siddal went ahead four minutes later. Garratt, Sean McCormack and Ben Hinsley took play up field. Jake Smith then swung a long pass out to Danny Williams, whose great ball allowed young centre Henry Turner to dive over in the corner. Siddal were leading 10-6 up the slope and looked to be coping well with Underbank’s tactics as Fred Walker, Lewis Hosty and Sam Walsh were all returning kicks and making ground. The visitors missed two try-scoring opportunities around the 20 minute mark. Both Jake Smith and Byron Smith looked certain scorers but neither could ground the ball. Underbank took play down field and a final tackle reverse kick by Pogson was taken unopposed by winger Sam Ansell. Pogson’s conversion regained the lead for the home side at 12-10. That was extended to 18-10 after 36 minutes when sloppy tackling allowed Ansell in for another score, once again improved by Pogson and that was how the score remained up to half time. Siddal came out in determined fashion for the second half and Garratt made a fantastic break from inside his own half, swatting away the Underbank defenders to touch down at the end of a 60 metre run. Blackburn’s kick reduced the deficit to 18-16 after 45 minutes. Siddal were now on top and from the next set the pack made 80 metres and looked to be setting up a scoring position when a pass was intercepted for Pogson to race away and increase the home side’s advantage to 22-16 after 48 minutes. The visitors regained a dominant field position with Byron Smith, Jack Georgiou, George Ambler, Garratt and McCormack all making ground down the slope. Another promising position was squandered as Siddal once again threw a ball out which was intercepted for Ansell to score his hat-trick try after backing up Chatterton for another 80 metre score. The kick was again missed but at 26-16 after 53 minutes Siddal were scratching their heads at the score line. They boosted their hopes of a comeback after 65 minutes when Williams once again put in Turner for a try out wide, improved by Blackburn, and at 26-22 it was all to play for. However, with two minutes left Joe Bobbin pounced on a Pogson grubber kick to seal the win for Underbank. Pogson’s kick completed the scoring, leaving Siddal to lick their wounds with a break before their next game at home to Egremont on June 30. The second team had a morale boosting 22-20 win at home to Bramley Buffaloes in the Yorkshire Men’s League.